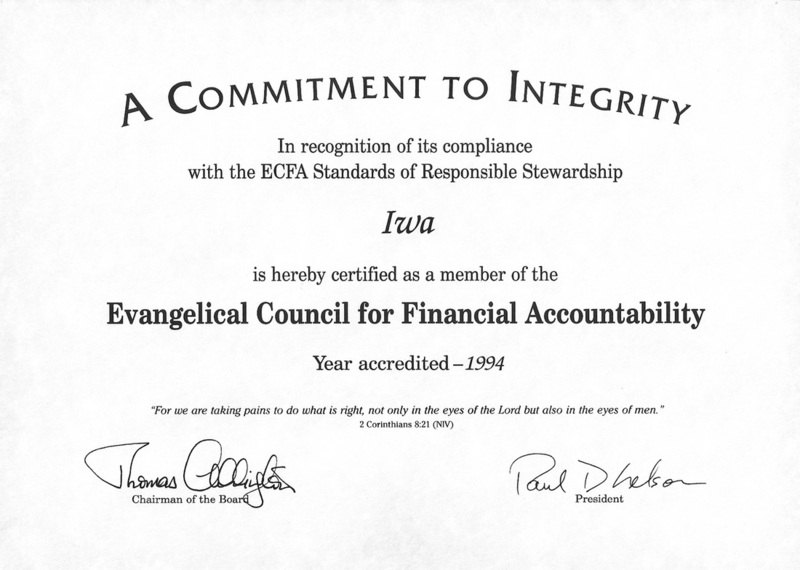 ECFA stands for the Evangelical Council for Financial Accountability. Iwa was the first parachurch ministry in the Japanese American Christian community to become a member of ECFA and has maintained the high standards of membership in ECFA since 1994. According to ECFA's own website, "ECFA is an accreditation agency dedicated to helping Christian ministries earn the public’s trust through adherence to Seven Standards of Responsible Stewardship™, which focus on board governance, financial transparency, integrity in fundraising, and proper use of charity resources. ECFA membership entitles a ministry to use the ECFA seal and receive other membership benefits. The continuing use of the seal depends on the ministry's good faith compliance with all ECFA Standards." For more information go to www.ecfa.org.